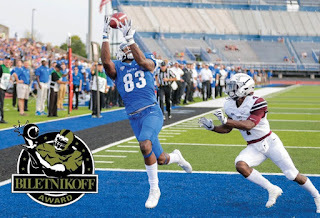 BUFFALO, N.Y. -- University at Buffalo wide receiver Anthony Johnson was named to the Biletnikoff Watch List on Thursday morning, the Tallahassee Quarterback Club Foundation announced. 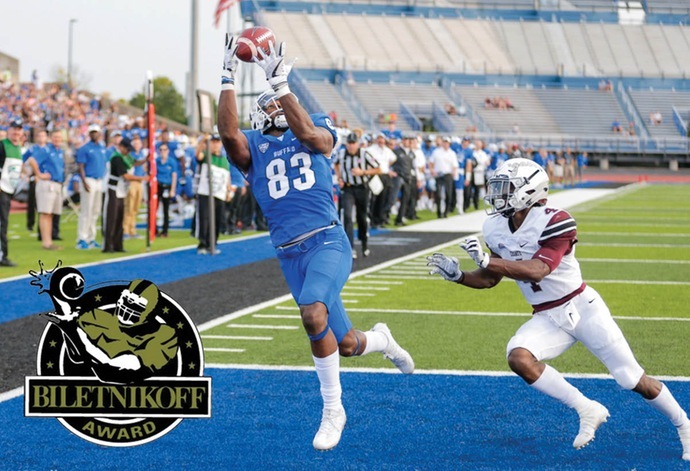 The Biletnikoff Award annually recognizes the outstanding receiver in college football. Johnson is one of seven players from the Mid-American Conference on the list. Johnson, who was also named to the 2018 Maxwell Award Preseason Watch List, is coming off a breakout season with the Bulls. In 2017, he had 76 catches for 1,356 yards and a school-record 14 touchdowns. He ranked second in the nation in receiving yards per game (113.0) and third in receiving touchdowns (14). The All-MAC First Team selection had six games of 140 or more receiving yards which was tops in the country. The 2018 Biletnikoff Award winner will be presented live on December 6, 2018, on The Home Depot College Football Awards presented by Gildan to be broadcast 7:00 - 9:00pm (EST) on ESPN. College and pro football hall of famer Fred Biletnikoff will announce the 2018 Biletnikoff Award winner on the show. The correlation between Biletnikoff Award winners and stardom in the National Football League is nearly uniformly consistent. Past Biletnikoff Award winners include Calvin Johnson, Randy Moss, Michael Crabtree, Amari Cooper, and Larry Fitzgerald.